Flickr iShowPhoto is a cool app that help you to manage Flickr web albums, and create slide show with photos in your iPhone/iPod Touch. √ Upload photos to Flickr, also support batch upload. 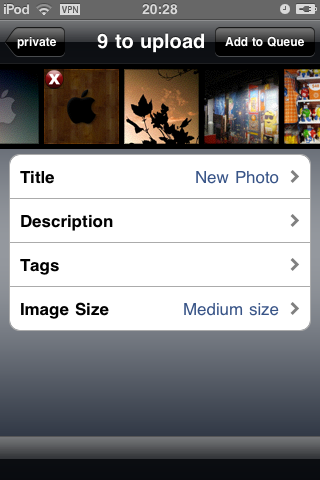 √ Select photos from your album, faces or events that synced from iTunes to create slide show. √ Choose animation themes, to control how photos will show up or disappear in the slide show, including "Classic", "Fade", "Replace", "Cover". 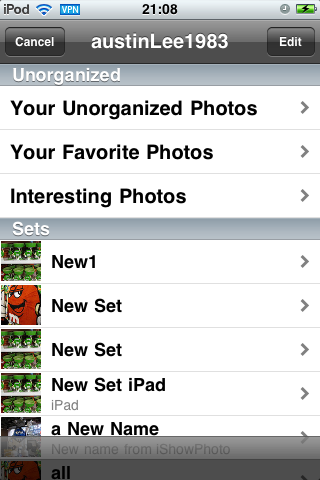 √ Sort photos in your favorite way. √ Choose media items from your iPod library, to play music in the background while showing the slide. 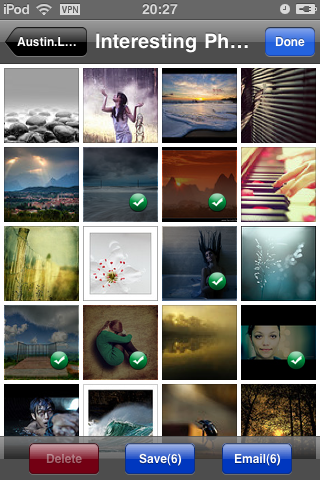 √ Setting animation time and animation interval, so that switching between photos can match your music medoly. √ Save multiple slide shows, so that you can play them in the future. With iShowPhoto, you can show your photos to your friends from a cool way. 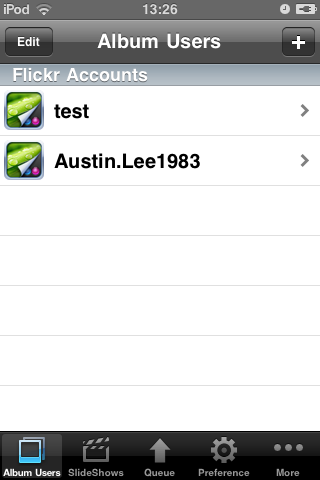 1.Create a new slide first, click the '+' button at the right top corner when you first enter the app. 2.Input the slide show's name and optional description, so that you can find and replay it easily in the future. Note: the slide show name must be unique, or it cannot be saved. 3.Select the slide show themes, including "Classic", "Fade", "Replace", "Cover", and more is coming. 4.Set animation time and animation interval, animation time is used to control how long each photo's animation last, and animation interval is used to control how long each photo is in still state before next photo shows up. 5.Select sounds to play in the background. If you choose to use more than one song, you can arrange the sort of songs by clicking 'Edit' button. 6.Select photos, and rearrange them. To rearrange photos, press one photo for a few seconds, until a 'x' button appears on each photo's thumbnail view, then you can delete any photo or drag and drop to change its position. Note: after you select photos, the app may take several seconds to copy selected photos to its local folder, the amount of time depends on the number of photos selected and their quality. 7.Then click 'play' button, enjoy it! If you encounter any problem or have any good ideas, please feel free to contact me via 'Feedback' in the app, any feedback or suggestion is appreciated.